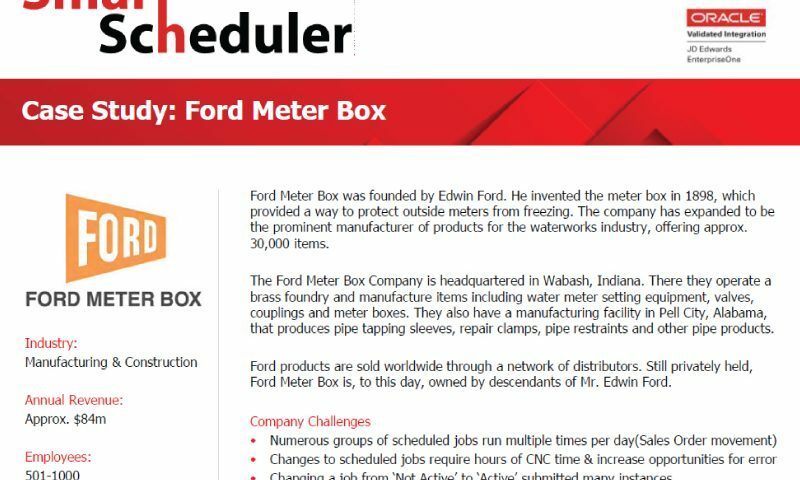 The Ford Meter Box Company is headquartered in Wabash, Indiana. There they operate a brass foundry and manufacture items including water meter setting equipment, valves, couplings and meter boxes. They also have a manufacturing facility in Pell City, Alabama, that produces pipe tapping sleeves, repair clamps, pipe restraints and other pipe products. Ford products are sold worldwide through a network of distributors. Still privately held, Ford Meter Box is, to this day, owned by descendants of Mr. Edwin Ford. Smart Scheduler is an advanced batch processing tool made to meet the unique needs of EnterpriseOne customers. Built within the JD Edwards interface, Smart Scheduler provides great functionality & a seamless user experience.